Please note that this is a self-test. If in doubt, please contact your optometrist or ophthalmologist. Wear your usual glasses or contacts. Hold the grid 30 cm from your face. .
Cover one of your eyes with your hand. 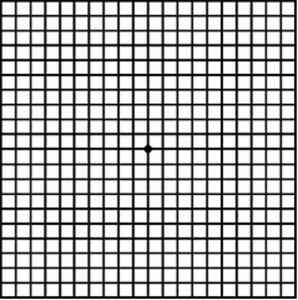 With the other eye, look straight at the centre of the grid. Watch closely what happens: – do you see crooked lines or distortions? Please contact your (eye) doctor. – do you see black or blurred spots? Please contact your (eye) doctor. Repeat the test with the other eye. Would you like your eyesight tested by a specialist? Make an appointment with an eye care store nearby. Click here for more information about Age-related Macular Degeneration.